ADM Marketing has added a new social media management arn to its business. Headed by social media expert Rachel Barratt, ADM now manages the social media platforms of many of its clients, publishing timely copy and creating lots of customer engagement. 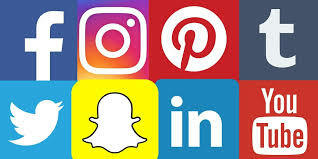 Tony Moss said: "Most clients nowadays want a social media presence but they often find it difficult to maintain a regular presence meaning the content is quite often out of date. "We are now able to take away that headache and with Rachel's skill and eye for engaging content we can offer a fully managed solution for minimal investment." ADM has hit the ground running at the start of the new year with a string of new business wins. These include Medburn Homes for whom ADM will be providing full marketing support, including PR, media planning, design and social media management, for a new 55 house development in the North East. Meanwhile ADM is working with respected Hull developer Marsden Builders on marketing a new residential development in Willerby. Tony Moss of ADM Marketing said: " What a start to the new year! It is clearer than ever that developers love the fact that we provide a full range of services giving them a single point of contact for all their marketing requirements which we deliver in a timely, creative and cost efficient manner." A digital advertising hoarding noted at Elland Road Stadium was the catalyst to the latest new business win for ADM! ADM Managing Director Tony Moss explains: " From my position in the West Stand I noticed a sign for Erris Homes who at that point I was unfamiliar with. Having done some background reserach I was sure we could add real value to their marketing effort and on that basis I made contact. "For once my timing was spot on and following a couple of introductory meetings we are now firmly part of their team providing marketing support." ADM's first task has been to support the launch of a new Marketing Suite at Orchard Croft, a new residential development in High Green, near Sheffield. 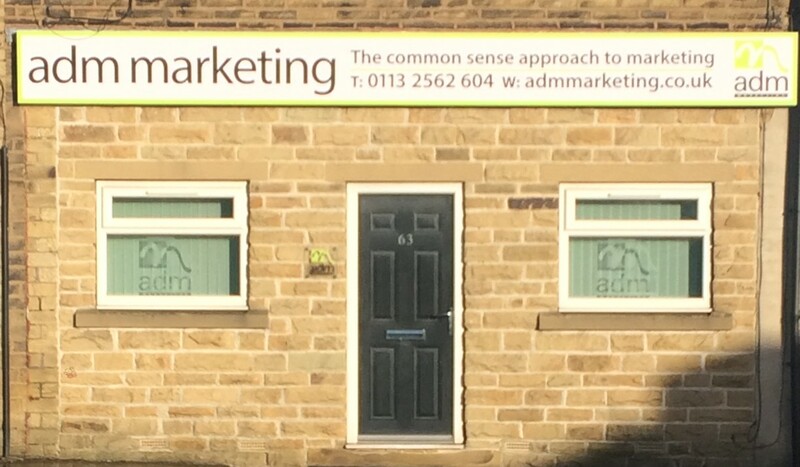 A new estate agency and property consultancy has appointed ADM to handle all its marketing, social media and brand requirements. Furnell Residential has been launched by Ben Furnell who has extensive experience of the Yorkshire property market. Tony Moss of ADM said: "We are extremely excited to be working with Ben and his team to help develop Furnells into one of the leading estate agents in the region. Their extensive local knowledge and personalised service is a strong combination which will set them apart from the competition." ADM is delighted to be working with leading physiotherpay company Sano Physiotherapy on a range of projects including online marketing. Tony Moss of ADM said " Sano is an exciting business with ambitious plans and we look forward to suporting them on this journey." ADM has completed the design and build of a website for property developer North Bar Homes. The site went live recently and will be used as a platform to promote the company's latest development, Greenfields in Bridlington, as well as showcasing previous schemes. Tony Moss of ADM said: "The website is part of a wider strategy to increase the profile of the business and further enhance its reputation for building high quality homes across East Yorkshire." ADM has completed the branding of a new property scheme in York. Abbey Court is a prestigious development comprising of just four high quality executive-style homes which sre being built by local developer Kyme Homes. In addition to the logo ADM has produced a 16 page sales support brochure and all site signage, working inconjunction with both the client and the selling agent. Tony Moss of ADM said: "Abbey Court is a prestigous development and all the materials we have produced reflect this. We have worked with Kyme Homes previously and long may this relationship continue." ADM has completed a major marketing asignment for a new residential development in Birstall called The Smithies. Working for Strategic Team Group on behalf of Connect Housing, ADM has produced a full set of computer generated images, floor plans/ site plan and signage as well as designing a new logo to support the sales effort. ADM won the work after being recommended to Strategic Team Group by another client. Tony Moss said: "There is nothing more rewarding than receiving an inbound enquiry on the back of work we have done for other clients. The fact that the majority of our work comes from recommendations is a teriffic endorsement of our capabilities and client service." ADM Marketing has helped launch a new business. Pinder Asset Solutions chose ADM to create a new corporate identity which has been introduced across a range of collaterall in readiness for launch. ADM also designed and built a fully responsive database driven website which amongst other features will allow Pinder Asset Solutions to offer a platform for online auctions and private treaty disposals. After several years in our existing premises we have finally got round to installing some external signage. A big 'thank you' to local business Wright Sign Service for their efficient production and installation service. 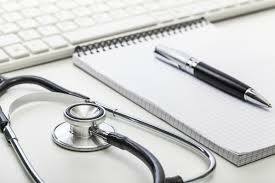 Yorkshire Medical Accountants (YMA) has appointed ADM to develop a new website. The specialist accountancy firm currently has no internet presence and ADM is looking forward to putting that right. ADM will also develop a website for sister company Yorkshire Company Accountants as well as creating a new corporate identity for both areas of the business. Fulneck, the leading independent school on the outskirts of Pudsey, has appointed ADM to handle all its PR. The relationship got off to a flying start with a story about Year 5 pupil Leigh-Taylor Arundale who was making poppies for every pupil and staff member receiving widespread coverage in the local and regional media, including a segment on Look North! 'We have dealt with ADM Marketing Ltd for well over 10 years and they have become a trusted and valued member of our team. I couldn't have put it any better! ADM has been appointed to handle the PR and various marketing projects for a flagship residential scheme in Pudsey. Tony Moss of ADM Marketing says: 'There is no question that Dawsons Square is one of the largest schemes of its kind to come to market in the area for years and we are delighted to be involved. Fifteen years ago, almost to the day, I had the crazy notion of starting my own marketing agency. 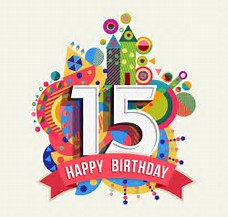 Fifteen years later I'm still here and that in itself has proved a lot of doubters, cynics and anyone else who boarded the band wagon of negativity wrong. 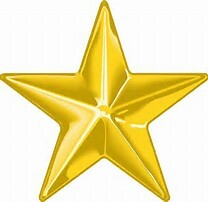 There are plenty of people who have contributed to the journey, not least those clients who backed me from the beginning and still use me today, suppliers who accepted work with little assurance of being paid and of course my loving family who took the brunt of my mood swings which matched the many ups and downs I've experienced. But the biggest thanks go to all those people who didn't back me, those who promised meetings and didn't deliver, who promised to return phone calls and didn't and those that promised the big, life changing projects, that just didn't quite materialise. Through them came the drive and determination to succeed. When a valued client asked if we could create a logo for his partner's new dog grooming business, Cute as a Button, we thought he was barking mad. Of course we were happy to oblige - check out the finished result opposite. Good luck with the new venture guys. Free haircuts for Billy Moss? ADM has been appointed by PE Partner to spearhead its PR and marketing. The Leeds based company supplies coaches to primary schools to help deliver the PE and sports curriculum. They have also recently developed SPIRALPE™, an online platform to help improve the delivery of sport in primary schools. This is being officially launched at The Education Show at the NEC on March 16-18. Premier Construction has appointed ADM Marketing to provide marketing support for a major residential development scheme in Wombwell. The remit extends to branding, signage, print, pr and digital. IT's OFFICIAL. ADM IS AMAZING! Sometimes a few words say a lot about the level of service ADM provides. We had great fun meeting a whole load of talented school children who entered Manning Stainton's 'Draw your Dream Tree House' competition. The county wide competition attracted over 500 entries and was won by Isabelle Whitaker who attends Yeadon Westfield Junior School. Isabelle received an iPad Air and the school received a cheque for £500 which is going towards the conversion of the former caretaker's cottage into an additional learning space. ADM has landed a new piece of PR business after a chance meeting while working on another project. Tony met Siobhain Goodall, Head of Business Development at outsourced customer contact specialist mplcontact, during a PR excerise for established client Manning Stainton and struck up an immediate rapport. Bishop's Wood is a stunning development of just 3 bespoke detached houses in the Sandal area of Wakefield. The prominent entrance to the site required high impact signage which was designed and produced by ADM, much to the client's satisfaction! New Street Mills in Pudsey is a converted mill which on completion will provide just 12, two bedroom apartments. The prominent road side position was perfect for signage, a task successfully completed by ADM.
Woodside Close in Earby, near Skipton, is a select develiopment of just 3 detached houses. ADM is finalising all external signage and a design led ibrochure in readiness for a full marketing push. ibrochures are becoming more and more popular as they can be produced at a fraction of the cost of traditional print brochures. 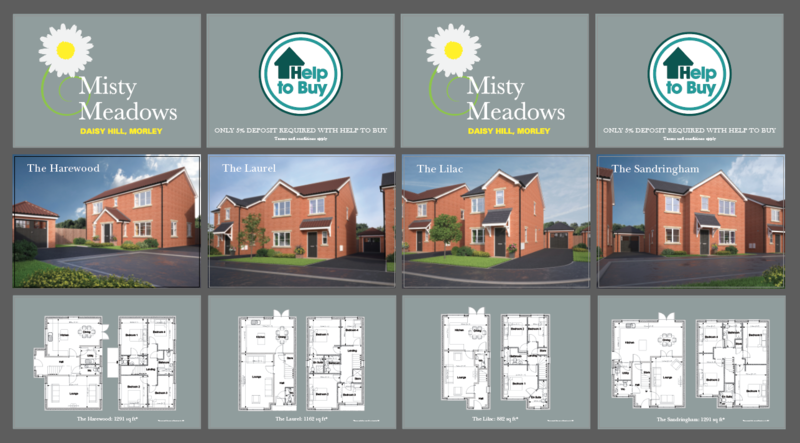 The Misty Meadows scheme in Morley required multi-layred marketing support. This included signage, estate agent point of sale materials, leaflets for targetted distribution and a successful PR campaign featuring the first buyers. High sales figures suggests the activity is certainly working! 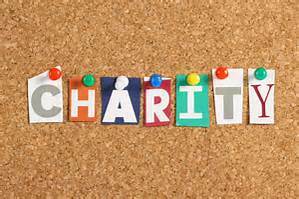 A number of clients do their bit for charity and now it's our turn. In the last few weeks ADM has supported three great causes in our own little way. Firstly we took an advert in the Annual Dinner Brochure of the Leeds Jewish Welfare Board, a cause very close to the heart of one of our long standing clients. We also donated a gift voucher to a client to use as a raffle prize during a day of fund raising for MacMillan Cancer Support in Leeds city centre, which raised over £5,700! Meanwhile The West Yorkshire Multiple Sclerosis Therapy Centre in Leeds was keen to promote the progress of its fund raising to visitors to the centre by way a giant thermometer - enter ADM. We designed the artwork and produced the free-standing device at no charge to the centre. To say they were grateful was an understatement! And that's not all. We have also renewed our sponsorship at Pudsey St Lawrence Cricket Club for the 2016 season. After months (well years actually) in the planning ADM is delighted to announce the launch of its brand new web site. The site is designed to give a concise overview of all the service that are available, a breakdown of clients and some rather nice testimonials. It also has a section dedicated to the work the company does in the property sector - one of ADM's many areas of expertise. Although far from perochial in either geographical reach or client base, ADM is fiercely proud of its Yorkshire roots and heritage which is reflected in the iconic images on the home page. ADM has completed a range of marketing materials to support the launch of a new apartment scheme in York. The Walk on Holgate Road is a refurbishment of an existing office building into 50 apartments, with outside space incorporating an urban orchard. 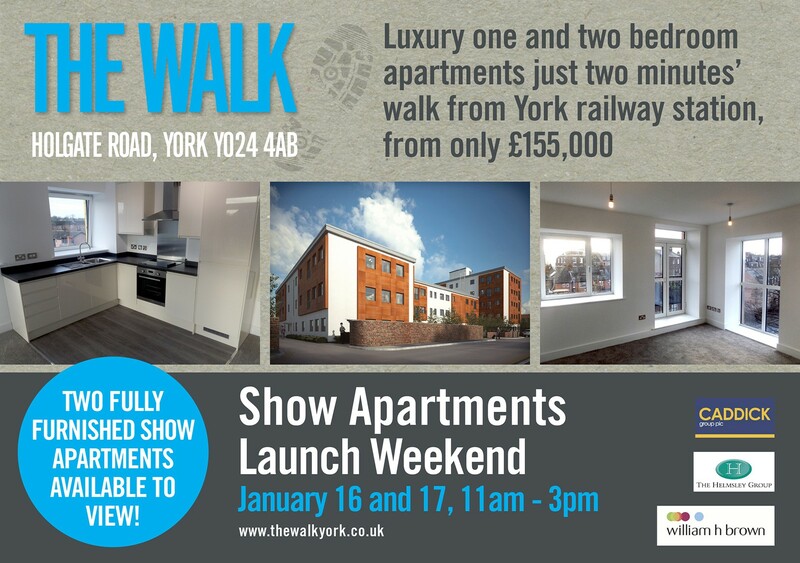 A real feature of the site is its proximity to York railway station which is less than 2 minutes’ walk away. Tony Moss of ADM says: ‘This is a high profile scheme close to the heart of the city which will be ideal for first time buyers, young professionals and investors. We are delighted to have played our part in bringing it to market.